The Vermont’s New Economy Conference on December 7 brought together 110 individuals from across Vermont and its neighboring communities. 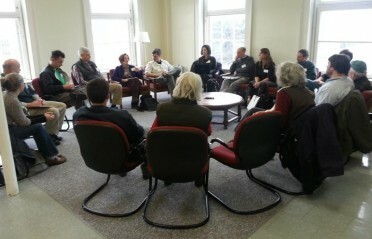 Attendees included members of Vermont’s legislature, local business owners, educators, nonprofit employees, and others. After a keynote address by Ellen Brown of the Public Banking Institute, participants split up to take part in three rounds of concurrent sessions on various New Economy topics. These sessions were split into five separate tracks—Public Banking, Measuring What Matters, Complementary Currencies, New Finance and Investment Opportunities, and Ownership Models. The conference sessions were organized using an Open Space format, which allowed attendees to suggest sessions on their topics of interest, discuss their ideas and concerns in groups, and move between sessions as they saw fit. On an individual level, one of the primary results of the conference was the great amount of learning and networking that participants gained as they shared their knowledge, stories, and ideas. For DMI, one very important result was the emergence of themes, needs, questions, and actions relating to the development of a new economy. These results are detailed below. They will help guide us as we move forward to develop a healthier, more local, and more resilient economy in Vermont. We need to develop the language to discuss New Economy issues with the public and the legislature in a way that will resonate. Public conversations about new economic alternatives and opportunities need to become mainstream. There is a tremendous amount of information out there about New Economy ideas and possibilities, but people don’t know how to access it. We need to make new economy ideas attractive and clearly communicate a goal worth achieving. We need to create a sense of urgency around economic issues and the formation of a new economy. There are psychological barriers to talking about money that we will have to work through. We must learn to see beyond the money value in things and think of money as just one tool to help us achieve other goals such as learning, happiness, fulfillment, and growth. We have to change our focus from a “me” to a “we” concept and emphasize community. The New Economy’s focus on common good and non-monetary values is a real attraction for many people. 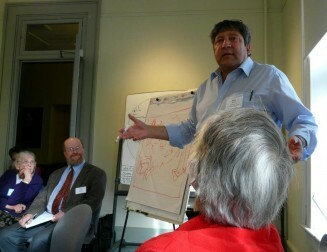 There is a lot of interest and energy in Vermont to make progress on economic and social issues. Most people at the conference were already involved in some sort of sustainability work, and they want ways to put these new ideas into practice now. The coalition of support needed to pass bills and get governmental action on issues like public banking is not there. At the same time, the opposition to public banking hasn’t formed yet, either. The same is likely true for other new ideas like time banks and alternative indicators. Sustainable institutional support will be needed to keep things like time banks and public banks going. Conference attendees represented a whole set of institutions and interests in the area, but there needs to be a coalition that can organize their collective actions and efforts. As one attendee commented in the wrap-up session, “We represent a whole set of institutions and organized groups of people working on similar things. Building a coalition is going to make the change that we need.” This desire for unification and collaborative action was also reflected in the formation of working groups during some of the sessions, including time banks and GPI. The talks and discussions at the conference brought up many questions about the New Economy and how to implement it. While many were specific to particular session topics, a number of broader questions were raised that span the many facets of a New Economy in Vermont. Discussing, researching, thinking, and experimenting with these questions will be an important aspect of DMI’s work going forward. If you have any thoughts about them, please share with us by leaving a comment below! What is an economy, and what is it for? How can we value the things that matter most? What will be the scope of Vermont’s new economy? How do we define local and how do we fit into the larger economy? How do we fund these ideas and support them in the long term? How do we make information easily available to the public? What are the leverage points we should target to create a new economy in the quickest, most effective way? In addition to learning and sharing ideas, the conference also resulted in specific action steps and focus groups that are already working on carrying New Economy ideas forward. Many of them are steps that you can take, too! Please email us at info donellameadows org if you would like to be added to the Vermont Coalition for a New Economy list. DMI would like to thank each and every one of the participants who shared their ideas and enthusiasm at the conference and helped us learn. Improving and strengthening our economy is a huge project that depends on the involvement and support of many caring people. Please get involved by sharing your thoughts and reactions below and by keeping in touch via Facebook and Twitter for updates about future events!